Miyagi Chōjun’s disciple, the late Shinzato Jin’an, participated in a karate demonstration at Meiji Shrine in 1930. When at this occasion he was asked about his styles name, he had problems to answer the question and later reported the incident to Miyagi. Therafter the style’s name “Gōjū-ryū” was chosen. Why and how did Miyagi chose this antagonistic term as the name of his style? It was taken from the book called Bubishi in Japanese. This book represents a written tradition of a southern Chinese branch of Shaolin-boxing called White Crane Gate[i] from Fujian province in S.E. China, which had been transmitted to Okinawa. 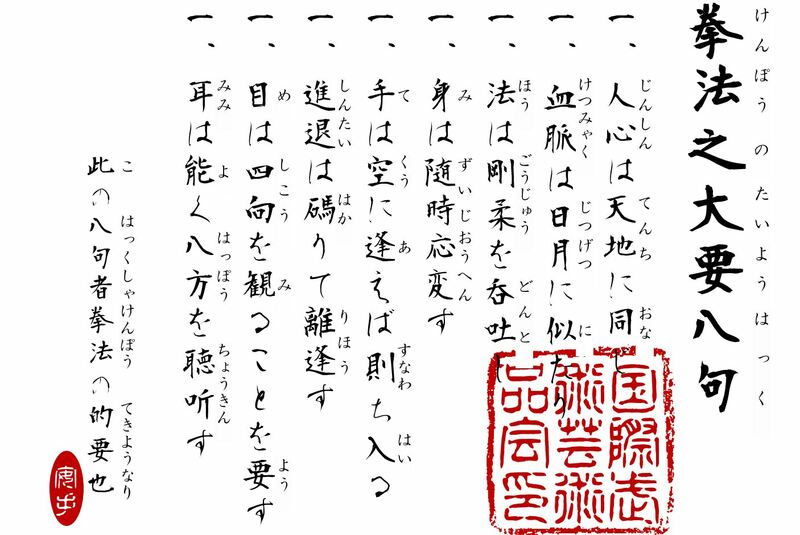 Following Chinese traditions, the text also contains cumulative citations from previous master pieces, like SunTsu’s The Art of War and Qi Jiguan’s Jixiao Xinshu. In the Chinese language in which it was originally written, Bubishi basically means “Account of Military Preparation.” A more subtle interpretation would be “Account of Defense Preparations” or — adopted to it’s conents — “Account of Preparions in the Boxing Skills”. This work also contained the “Eight Poems of Boxing.”[ii] The Gōjū of the styles name stems from the third phrase, which reads Hō Gōjū donto, with Gōjū being a technical as well as philosophical principle of the martial art. Gō and Jū are inseparability and constitute one body. Download your copy of The Eight Poems of Boxing here. [i] J.: Nan-ha Shôrin-ken Hakutsuru-mon. Ch. : Nánpài Shàolínquán Báihèmén 南派少林拳白鹤门. [ii] Quánfǎ zhī dāyāo bā jū 拳法之大要八句. 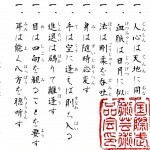 This entry was posted in Kanji art, Misc and tagged Eight Poems of Boxing, Eight poems of the fist, Goju-ryu name, Ho Goju donto, Miyagi, Shinzato Jinan, White Crane, Wubeizhì. Bookmark the permalink.